If your “Check Engine” light is on or the engine produces unusual sounds, it may be time for you to visit our auto shop for engine repair. Many automotive shops offer free check engine light diagnostics and in certain cases you can read the error code yourself, but this code is usually just a hint that tells where the problem potentially may be. It won’t tell you what exactly and how exactly it must be fixed. When something is wrong with the engine, last thing you want is improper diagnostics as it can lead to unnecessary spendings and waste your time. At Wolfgang’s Autos our certified technicians may diagnose any kind of problem with your engine and get it repaired quickly. Engine repair can be costly, so we will provide you with a honest and detailed explanation of the issue and possible solutions. We don’t sell you repairs that your car does not need. Although not every “Check Engine” flashing light leads to expensive repair, it’s important that you don’t wait to have your vehicle inspected. Because if it’s a serious problem, ignoring it can cost you thousands in repairs or even mean buying a new engine or car. Trust our professionals and schedule appointment with Wolfgang’s Autos today by calling (770) 623-3976. We are located in Duluth, GA at 4178 Abbotts Bridge Rd Duluth, GA, 30097. Our work hours are Tue-Fri: 8AM – 6PM and Sat: 8AM – 2PM. 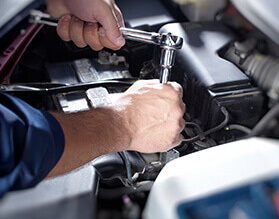 We offer a variety of auto repair services including diagnostics, oil change, body work, headlights restoration, breaks repair and replacement, balancing and any general maintenance. Please check our Services page for details. If you are not sure that we can fix your car, call us (770) 623-3976 with any questions.